Delhi : Raj Ghat, India Gate (War Memorial Arch), Rashtrapati Bhavan, Laxminarayan Temple, Parliament House, Qutub Minar, Humayun Tomb, Jawaharlal Nehru Stadium and Feroz Shah Kotla stadium in Delhi. Agra : Visit the Taj Mahal, Agra Red Fort and Itimad-Ud-Daulah in Agra. Delhi – Agra tour is called a ‘must to be visited once in a life’ tour. Really, you will feel the grace and Mughal attitude while visiting these cities. Explore the capital city and the monument of love with Travelogy India to make your holidays worth spend. This 4 days / 3 nights experience will be the lifetime experience that is for sure. Let’s have a brief day to day idea about the tour. Be ready for a warm welcome by our executive at Delhi's Indira Gandhi International Airport. Our attendee will drop you at pre-booked hotel. In between, he will explain the whole Delhi Agra tour including the destinations you are going to visit next days. Check – in the hotel, freshen up yourself and get ready to explore the Delhi, a capital city of India. 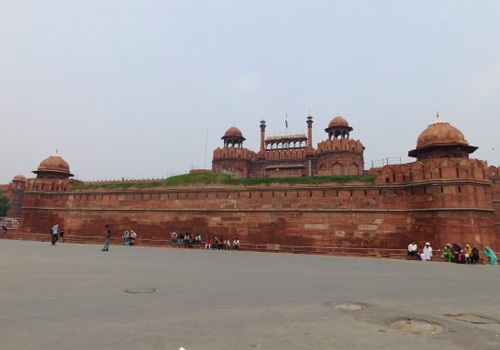 Visit Red Fort which was built by Shah Jahan in 1648. The architecture is completely built in Mughal style. Later, we will visit the Kingdom of Dreams which has the perfect blend of India’s Art, craft and culture. Explore the city in true sense by enjoying cultural shows. By late evening, return to the hotel and take dinner. Overnight stay at a hotel. Morning in Delhi will be pleasant. Have your breakfast at the hotel early morning. On Day-2, we will visit other attractions of Delhi such as Lotus Temple and Akshardham Temple. Lunch at the hotel and rest for some time. Later, we will leave for Agra from Delhi. Agra is around 235 KM away from Delhi which takes not more than 5 hours to reach by road. Check-In the hotel at Agra and refresh your mood to see one of the wonders of the world - Taj Mahal. Take a leisure walk to nearby areas. Have a delicious dinner and overnight stay at a hotel. After having a heavy breakfast in the hotel, we will leave for Agra sightseeing which includes the Taj Mahal, Agra Red Fort and Itimad-Ud-Daulah. The beauty of Taj is enhancing by geometrically perfect delegated gardens which create the balance of the entire Taj Mahal. It adds grandness to the delicacy of this monument of affection, commitment and virtue. Taj Mahal is created in delicate and immaculate marble and jewelled with semi valuable stones, where the Queen rests in peace with her King. Come and walk along the pathway close to the reflecting pool on the front side. After an exciting day with the Taj Mahal, drive back to Delhi and overnight stay at your hotel. On Day-4 morning, have a sumptuous breakfast and be ready for the major attraction of Delhi. We will visit Raj Ghat, India Gate (War Memorial Arch), Rashtrapati Bhavan, Laxminarayan Temple, Parliament House, Qutub Minar, Humayun Tomb, Jawaharlal Nehru Stadium and Feroz Shah Kotla stadium today. Fill your bag with memories of these places. At the end of the day, our journey will back to the social life. Drive towards Airport where our mesmerising tour will end. Reach to your destination with the everlasting memories of magnificent Delhi and Agra cities.